Are young adults really dominating public transport use? The world would be a much better place if transport operators would stop spinning patronage numbers to the media and public and start giving us the salient facts instead. The Financial Review reported on Thursday that travellers in Melbourne aged 20-29 years comprise 38% of all public transport users in the city. This figure is in line with the claim of the WA Public Transport Authority that 18-25 year olds comprise 35% of all train users in Perth and 40% of all bus users. As I’ve indicated before, I find these sorts of figures very hard to believe, given these two cohort’s each comprise around 15% of the population. In fact they’re extraordinary. It’s true young adults have always been over-represented on public transport because many are on relatively low incomes, but it’s the sheer scale of these figures I find too good to be true. The reality is they’re not true, at least for Melbourne. The real situation is shown in the first exhibit. According to the Victorian Department of Transport’s VISTA database, travellers in the 20-29 age group account for only 22.3% of public transport users on an average day. If confined solely to the average weekday, the figure is a little lower, 21.9%. If instead we look at public transport boardings – to allow for the possibility that young adults make more multi-modal trips than others – the proportion in the 20-29 age group using public transport is a little higher, but still only 22.9%. That’s a long, long way short of 38%. One explanation for this evident discrepancy could be that public transport operaters are measuring something else. VISTA is a snapshot of travel on a typical day, but it could be operators are counting the number of people who have ever used public transport – even if only once or twice – in some preceding period e.g. in the previous week, month or year. This will invariably give a much higher total patronage figure than VISTA or the Census because it picks up everybody who’s used train, tram, bus or ferry at least once during the (longer) period. Is the iPhone why Gen Y love public transport? The “mystery factor” driving faster patronage growth on public transport may be Gen Y’s enthusiasm for staying connected through smartphones. Speaking to a reporter from The West Australian last week, Professor Peter Newman argued that previous generations found freedom and flexibility through the car, but generation Ys find freedom and flexibility by staying connected to friends, family and workplaces through information devices like laptops or iPhones (H/T Human Transit). He went on to say: “They can stay connected on a bus or a train. They can bring the office with them. They can bring their study with them. They can’t if they’re driving”. The same news report also quotes a spokesperson from WA’s Public Transport Authority who says commuters aged between 18 and 25 years now make up 35% of all train users and 40% of all bus users, up from 30% and 38% respectively last year. 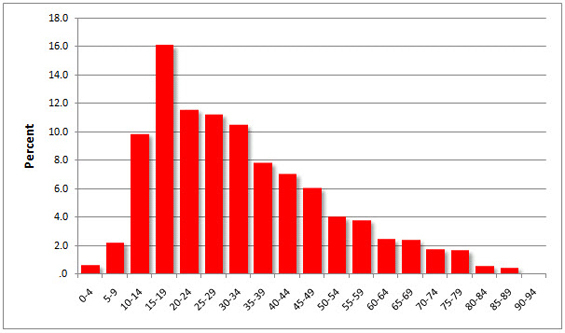 As this same age group constitutes just 13% of all Australians aged over 17 years, that’s a phenomenal set of numbers. Frankly, I’m a little sceptical about the claim that the patronage share of trains in Perth has risen five percentage points in just one year, but since I can’t find any other relevant information on the age profile of public transport users, I’ll (conditionally) go with it. However I’m in no way sceptical of the proposition that new technologies make public transport more attractive than it used to be. Like reading before it, the mobile phone was a big step forward in the 90s and now 3G means travellers can do even more things on the train or bus. Bring on free wi-fi – I hear even some stations on Sydney’s otherwise sad and sorry rail system have this facility. Does concern for the environment drive public transport patronage growth? According to a recent paper, research by the Victorian Department of Transport (DoT) suggests concern for the environment and a healthy lifestyle is a key driver of the recent surge in public transport patronage in Melbourne. DoT initially concluded that the primary drivers of growth over the period 2002-07 were population growth, higher petrol prices and growth in CBD jobs (see exhibit). Neither traffic congestion nor public transport service quality appeared to play a significant role. However a large proportion of the patronage increase on trains – equivalent to about 40,000 extra daily passengers – was not explained by the variables and/or the elasticities that DoT assumed in its modelling. This unexplained increase is labelled “Other factors” on the exhibit. Some research undertaken by Dot and Metlink suggested it might possibly relate to attitudinal factors. Of the top eight reasons given by respondents for reducing their vehicle use, environmental concerns and health & fitness ranked equal second behind petrol prices, but ahead of parking costs. Thus according to this research, nearly a fifth of Melburnians are now Public transport lifestylers who “align themselves with public transport due to a strong belief in environmental and sustainability issues, as well as a desire to live a healthy lifestyle”. 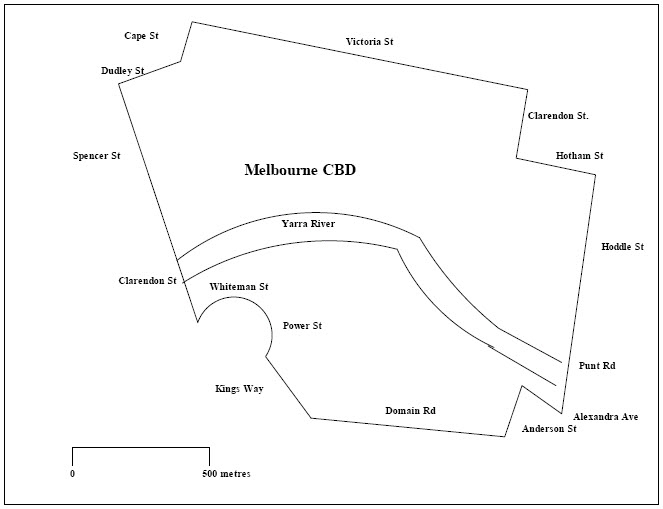 What’s surprising is that all six segments have almost no (significant) relationship with age, gender, income, education or distance from the CBD e.g. the large Lifestylers segment is not just made up of inner city Greens voters. While respondents in this segment don’t necessarily all use public transport, the paper concludes that “the results strongly point to attitudinal change having played a significant role in recent patronage growth”. 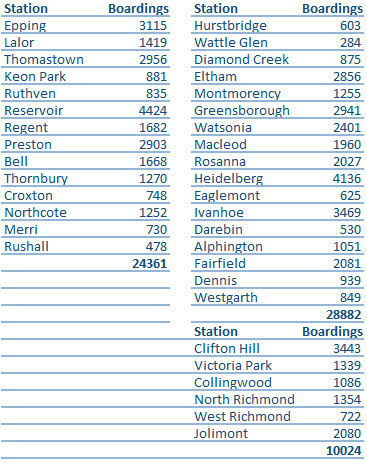 The President of the Public Transport Users Association, Daniel Bowen, posted some “unofficial” stats last week on boardings at Melbourne’s railway stations in 2008-09. I’ve used these numbers to put together the accompanying exhibit showing the number of weekday boardings on the Epping and Hurstbridge lines. These two lines join into one at Clifton Hill so I’ve shown the section from there to Jolimont separately (too much effort to do any other lines!). Daniel emphasises these numbers come with no warranty as to their accuracy but they did come from a “good source” in the Department of Transport. He reckons inflating the numbers by 11.4% will give a fair estimate of 2010-11 boardings. I want to make a number of essentially speculative observations prompted by these numbers (for the purposes of this discussion I’ll leave the numbers as they are). First, there seems to be no statistically significant relationship between the number of boardings and distance from the city centre i.e. from Jolimont to both Epping and Hurstbridge (admittedly my measure of “distance” is rank order of stations not kilometres, but I don’t think that matters). So while the proportion of the population resident around each station that uses the train generally declines with distance from the centre, the absolute number of boardings isn’t correlated with distance. This may seem surprising because stations close to the centre are more proximate to the CBD’s many and various attractions and might be thought to enjoy higher dwelling densities than more distant stations. However it appears that other variables, such as the accessibility of a station to the surrounding population, are a more important determinant of the number of boardings. Second, location on a junction of the rail network is not a guarantee of a large volume of boardings and nor does the absence of a junction mean a station will only ever have a minor role. Clifton Hill is the only station on this line that’s on a junction and has a reasonably large number of boardings, but not as many as Ivanhoe, Heidelberg or Reservoir. Is transit patronage really growing this fast? 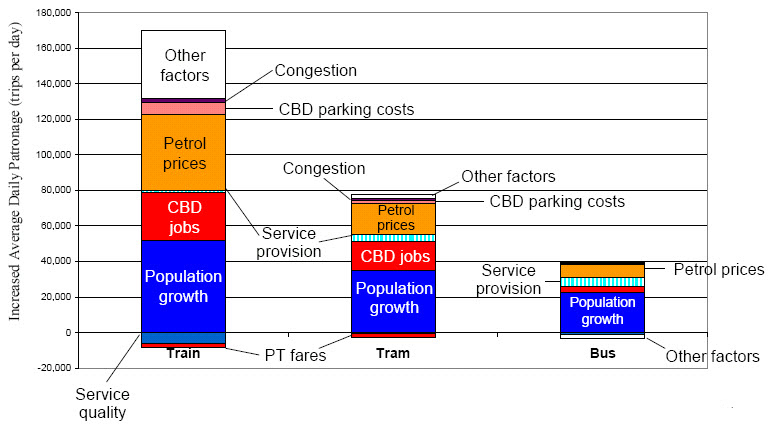 I’ve noted before that public transport patronage in Australian cities is increasing, but I didn’t realise just how dramatically it has escalated in Melbourne until I had cause to leaf through the Annual Review 2010 published by Metlink, the marketing organisation for Melbourne’s train, tram and bus operators. 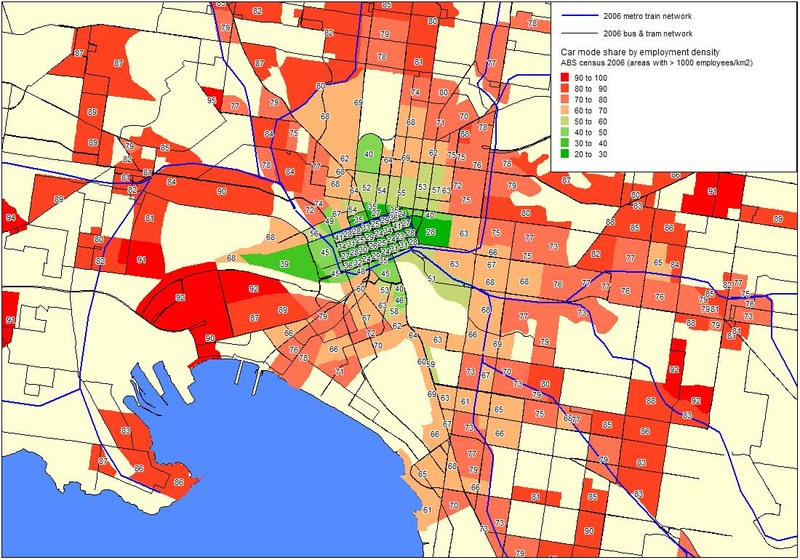 This claim really caught my attention: “Metlink research shows that 74% of Melburnians use public transport to get to work, school or leisure activities”. Three quarters of Melburnians?! That’s not merely astonishing, it’s mind-boggling. It comes as quite a surprise to me, as the Department of Transport’s VISTA database says that only around 11% of all weekday travel in Melbourne is by public transport and even in the case of education, only 25% of trips to primary, secondary and tertiary education are made by public transport. That quote can’t be dismissed as a one-off case of excessive zeal. This recent press release by Metlink also seems to strain credibility. It says Metlink has done a survey which found that “19% of Melburnians decreased their car use” in the past twelve months. It goes on to say that “62% of Melburnians (say) they will rely more on public transport than their cars” in the future. And this media statement released the same day says: “The study found that 94 per cent of Melburnians want governments to spend more on public transport……while only 68 per cent wanted taxpayer money spent on roads”. Dr Mees said he was sceptical about the dramatic jump in the number of people who claimed to be walking more, because if the 15 per cent rise were true, it would be unprecedented. ”I do feel that many people must be responding with the answer that they think the person asking the question wants to hear – it makes them feel good to answer that they are walking more,” Dr Mees said. Why is public transport patronage increasing? 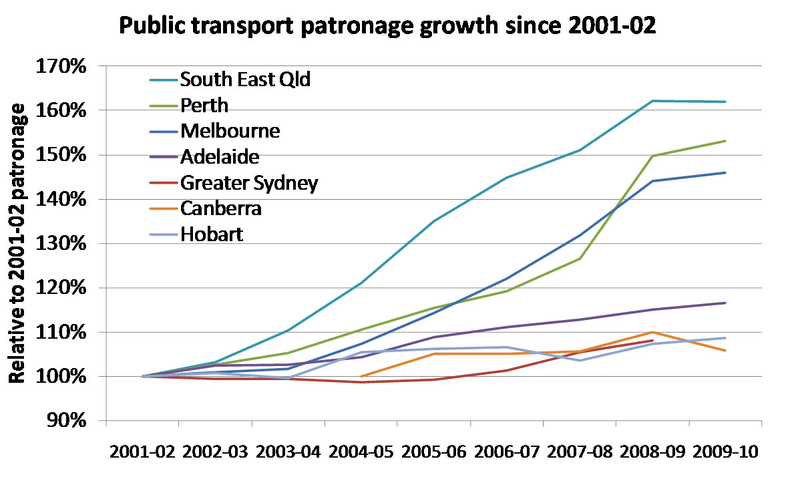 As the accompanying chart shows, public transport patronage has grown sharply in some of Australia’s capitals this past decade but the rate of growth has generally slowed significantly over the last 18 months. We’re accustomed to thinking that growth in patronage is driven by higher petrol prices but the chart indicates the explanation is probably more complex. In particular, the considerable differences between cities suggest that one single factor is unlikely to provide a satisfactory explanation. Patronage grew spectacularly in South East Qld, Perth and Melbourne, but was modest in Greater Sydney and unremarkable elsewhere. It needs to be borne in mind that all of this growth is from a relatively small base. For example, public transport’s share of all motorised travel (weekday and weekend) in Melbourne is even now only around 11%. This is only slightly lower than Sydney’s. Perth is likely to be only around half Melbourne’s level and Brisbane somewhere in between.